Moving home or office and lots of packing go hand in hand. This is often the part of the move that cause the most stress and can result in the most damage if hurried or done improperly. We put together a few tips on boxing up your belongings to try and help make removal day go smoothly. Firstly, you need to decide whether you are going to do the packing, or will you call on the experts to do it all for you? If you pack your own items, they may not be covered by your removal company’s insurance. Check with them before making a final decision. So you’ve decided to DIY, what do you need to keep in mind? A few weeks before The Big Move, start to collect cardboard boxes from your local supermarket for a variety of sizes. Ensure they are strong enough. Don’t forget that you may need to buy some specialised boxes, such as wardrobe boxes. 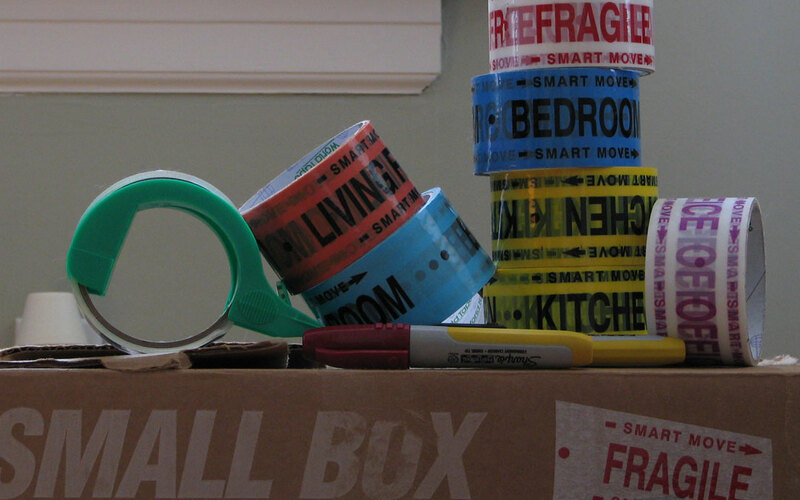 You’ll also need plenty of packing tape, bubble wrap, newspapers, large markers and labels. You can buy some of these materials in your local supermarket, DIY or craft shop. You can purchase sets of boxes for a whole flat / house move, which come with everything supplied. Shop around for the best prices. Keep all hazardous materials / products such as bleach, paints, etc. in a separate box, clearly labelled. Make sure you know exactly where they are packed, so they can’t leak and damage other items. Give yourself plenty of time. For an average sized house, if you start two months before the Big Move, you will be ready by the time you are moving out and this will save lots of stress in the final few days. This will ensure that all items will belong together when they are eventually unpacked and will you save you time (and stress). Begin with your garage, shed, etc., so that the everyday rooms are left to the end. Start with the non-essentials and leave a box in each room so that you can load in the lesser-used stuff. That way, all your essentials will be the last items to be packed and (hopefully) the easiest to find. Don’t forget to write down on each box what is in it: clothes, books, toiletries, etc. This will make unpacking so much easier at the other end. Extra tip: number each box for where you want them to go in your new residence. Then when you get there, stick a piece of paper on each door with the corresponding number and your removal team will know where each box needs to go, without having to ask you dozens of times! Keep your fragile items separate, such as vases and glassware surrounded with plenty of bubble wrap, newspaper, etc. Wrap crockery in plenty of paper, so that you will arrive with all of your plates and cups intact. Wrap bubblewrap around mirrors and tape them around to act as a “buffer” from any knocks that may occur in transit. It may seem obvious, but when you’re stressed, it’s easy to forget this. Pack heavy items at the bottom and smaller, lighter items at the top of boxes. Don’t try to stuff too much in, or the box may collapse and break. Don’t forget to keep your essentials to hand, bedclothes, kettle, food, toilet paper, to tide you over so that you don’t have to start rummaging through boxes when you arrive at your new home. Then sit back, relax and have a well-earned cup of tea before the next stage of The Big Move begins – The Big Unpack! If you enjoyed this article you may also enjoy these related posts. ASE Removals are an experienced removal company, providing professional house removals, man and van services, and office relocations for the Buckingham & MK area, and throughout the UK. We are committed to providing an excellent removals service, with customer service at the top of our priorities.